Coach's Corner - John Glenn 1962 Mercury flight flown flag. Go Back to Lot List John Glenn 1962 Mercury flight flown flag. This super rare, super cool, and obvious one of a kind is a Great American buy and hold investment and comes in a hand signed USPS vintage envelope. 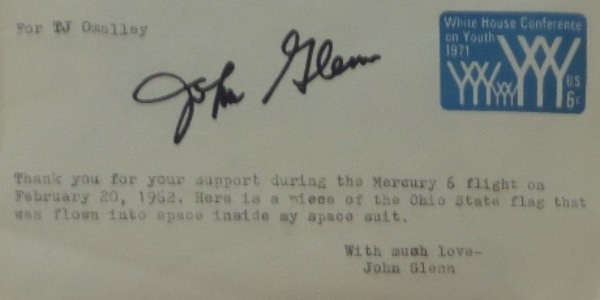 It is signed in bold black marker, typed with a message to a Mercury 6 Flight Supporter, and holds a real flight flown piece of the Ohio State Flag. It was held inside of Glenn's space suit, and values on these Nasa space rarities can climb to thousands!